Fall has come and soon it will be winter - the Christmas holidays are fast approaching. Did you book your Holiday Getaway yet ? It is still time -- there are some great places to ride over the holidays ! Either in the sun (Mexico, Central or South America) or riding through the snow in Quebec ... we still have some places on hold for you. Check out our Holiday Offers and Specials on the Hidden Trails website. A couple of weeks we got back from a three week trip to Mexico and it has taken me some time to put together a “Trip Report” – it was just all a bit overwhelming. I have travelled the world and have been to many countries inspecting equestrian trips, but seldom have I experienced such a variety of landscapes and cultures as on this trip. We visited the Mexican states of Jalisco, Guanajuato, Hidalgo, Mexico DF and Chiapas. The catalyst for the trip was the “Adventure Tourism Summit” in Chiapas and it turned out to be one of our best trips yet. We came home with two brand new trips that will be an excellent addition to our existing programs and of course we visited with our friends and partners of the existing rides..
-- for 2012 rates and dates, pleae refer to our website Have a Great Week ! Looking to go somewhere with a group of friends ? Now is the time to secure your best space for 2012! Dates and Rates are online ! Check out our NEW RIDES for 2012 ! A top of the line riding tour between the UNESCO Heritage places of Guanjuato and San Miguel Allende. Cross mountains, canter across open flats and through Catci areas and stay overnight at colonial haciendas and 4 star boutique hotels. One of the most unique and exciting riding tours in Mexico ... brand new - created out of inspiration on our last trip to this beautiful country of Mexico. A trip deep into Mongolia's wilderness is not a journey as any other. It is a wide open country, largely untouched by tourism once you are outside of the centers. Mongolia offers a true appeal to those looking for a unique culture, immense rough landscapes and untouched nature. 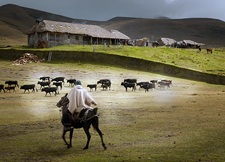 The people outside of the towns are still semi-nomadig, moving their herds with the seasons, as they have done for centuries. 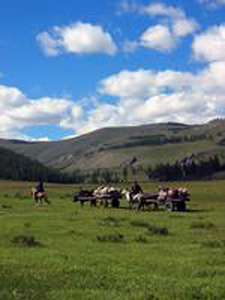 Half of the Mongolian population is Rural dealing with herds that represent the country's economy base. It is the homeland of Genghis Khan and its people have kept close contact to its unique culture and heritage. 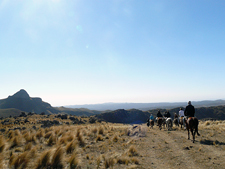 Come and encounter "fighting bulls" close up, bring in some "wild horses" and enjoy local wildlife that roam the ‘Paramo’ (high Andean habitat), including the unforgettable sight of the magnificent Andean condor soaring overhead. Stay at local haciendas in a stunning location with breathtaking views. 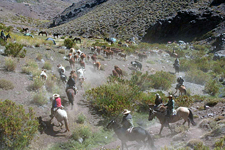 Join dozens of local chargas on a true "cowboy" adventure in the highlands of Ecuador - not for the faint hearted. Last month more than 600 travel professionals, representing some 50 countries, gathered in San Cristobal de las Casas, a quaint colonial-era mountain town in the highlands of Chiapas, Mexico for the Adventure Travel industry’s most important annual event, the Adventure Travel World Summit. It was opened by Mexico's Presiden Calderon. Many people embarked on trips prior to the event to journey beyond the headlines and discover the real Mexico. While exploring all the adventure opportunities that Mexico has to offer, what emerged was an abundance of tweets, news articles, blog posts and Facebook postings raving about Mexico. 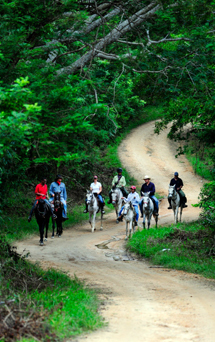 Hidden Trails participated in the Summit and took part of some of the equestrian pre-summit trips. Consequently I am happy to inform you that we are working on putting together a brand new adventure riding holiday in Chiapas .. the most southern state of Mexico. It is going to be a fantastic ride from the mountains, through the jungle all the way to the pristine beaches of the coast. Stay tuned for updates on this trip.